Grow Your Business Through Digital Marketing! Most companies – start-ups or established firms – have one common way of letting people know about their work. And that is a website. Publicity through social media accounts is secondary, but first comes the website. Some of them host one on their own. Those who can afford to, hire another company for the same. Either way, one tries to attract the crowd with a fancy, good-looking, user-friendly webpage. So how does a layman like you and me, or a company that has been developing websites for a long time actually host a website? 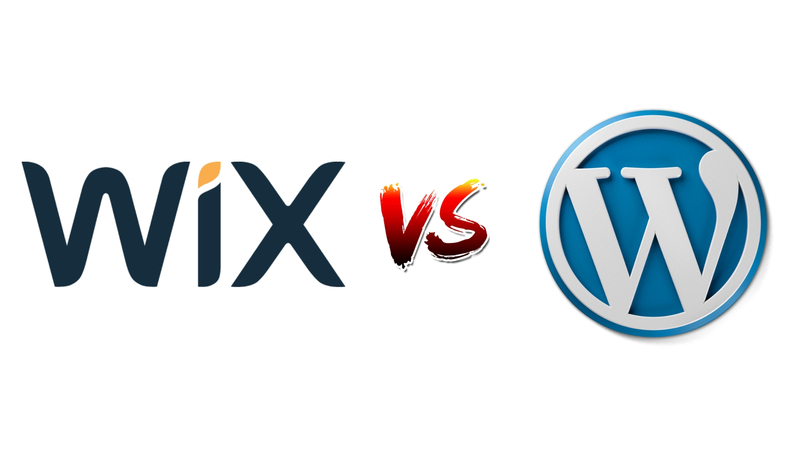 Wix and WordPress are two of the most famous names in the world of website hosting and content management systems (CMS). Here I will attempt to compare the two so that you can make a decision as to which one suits your needs better. Wix: We can safely declare Wix as the winner here. It has a very user-friendly and easily understandable interface. All you need to do is pick a template or a design, edit it according to your need, and you’re done. The only time you’re going to have to touch the keyboard while using Wix is when you actually need to type some content for your website. Otherwise, you just click, drag, and drop the desired window in the desired place. WordPress: It doesn’t quite work in the same way with WordPress. Here you need to have the knowledge of how a particular layout is made using HTML/CSS. A basic knowledge of both of those is a must if you want to use WordPress. Hence things will be tough for a beginner and he would prefer Wix over WordPress any given day. Wix: Hands down the most important part of any website, most would say. Wix has over 500 designs/templates from which to choose. You can customize each of them as you like. They have made sorted the templates into categories like eCommerce, Art, and Craft etc. The downside is that once selected, a template can’t be changed. You have to stick to it. Not a big deal, if you ask me. WordPress: Many free layouts are readily available on wordpress.org and the paid stuff is available on sites like https://themify.me/, https://www.cssigniter.com/. WordPress has thousands of customizable free ones. Since it started as mainly a blogging platform, you will find many of those kids over there. Although you don’t get to edit in the what-you-see-is-what-you-get (WYSIWYG) mode. So one needs to be able to interpret the source code to understand the changes that have been made. Wix: It gives us 200+ apps options. Some of those are Event Calendars, Comment Sections, Gallery and so on. Most of them are free. They are just as easy to use as the main designs. WordPress: WordPress has in excess of 5500 plugins, of which most are currently being actively used in more than a million websites. And there are some plugins which are available to premium users as well. 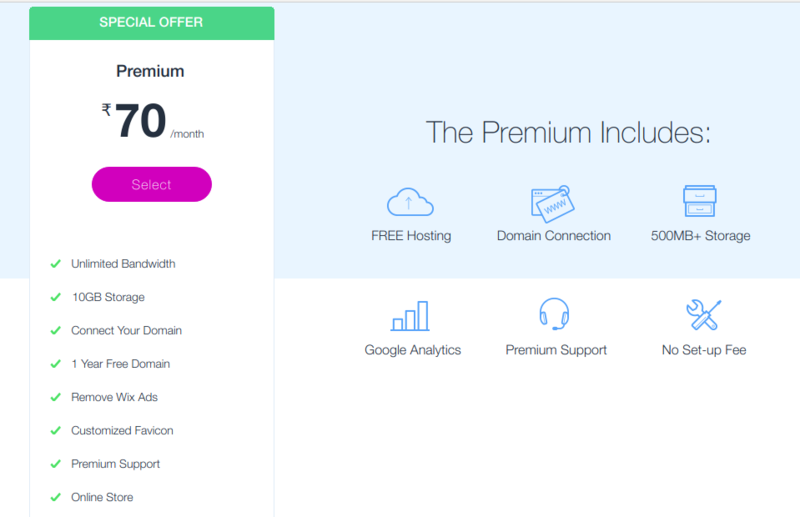 Wix: It has only one premium that costs Rs. 70/- month. All the premium benefits get unlocked once you take this plan. If one expects to generate a decent income from their website, then this is a very good option. WordPress: It offers different grades of premium plans. According to your role, you can pick a Personal plan or a plan suitable for a Freelancer or there’s one for a Business. They are priced at Rs. 200/-, Rs. 350/- and Rs. 800/- per month, but billed yearly. The business plan has all the features unlocked and it gives you unlimited storage to work with. Wix: They have a whole education series WixEd dedicated to teaching how to use Wix. What more does one need? The official support forum contains over 250k topics. They have also supplemented all of this with many videos. And, yes, they also provide email support. WordPress: You can find a WordPress expert in your professional circle very easily. If you can’t, then you’ll be out of luck because they don’t have an official support team. Our vote goes to WordPress because of the following points. Working with WordPress requires some basic knowledge of web development. So using WordPress will expand your knowledge about this domain and help you in the future. Also, being a WordPress developer looks great on your resume. Job opportunities will come knocking your door if you have this added to your CV. We think both platforms make a pretty good case for themselves. We personally feel there is no one solution for all the requirements, here. If you’re very clear with your goal and have the knowledge of website development to back you up, you’re already on the WordPress website, designing your site. Wix should be your choice if you are looking to try things out with your new venture and experimenting with the look and feel of the website. I am sure this article is worth reading. For more details and queries you can fill the FORM here. Till stay tuned to the website, we will be backing soon with some more exotic topics. Really detailed and in-depth information on wix and wordpres. i already purchase 70month for yearly pack just i want to know after this end the package price remain same or it ll get changes to expensive? Flipkart Vs Amazon| Which Affiliate Program Is Better? Copyright © 2019 · Digital Dhairya - Grow Your Business through Digital Marketing!